Hitler used shameless self-promotion and alternative facts to cast himself as a national hero. Photo courtesy of Wikimedia Commons. This was his own fault. For years, he had steadfastly refused to be photographed and had not given anything about himself away in his speeches. Instead, he had relied solely on the power of his voice to create a following for himself. And while his carefully choreographed speeches had been sufficient to turn him into the enfant terrible of Bavarian politics, Hitler concluded that his chances of becoming the face, or at least a face, of the national revolution were close to nil if people did not even know what he looked like. So he went to the opposite extreme—producing picture postcards of himself and distributing them widely. 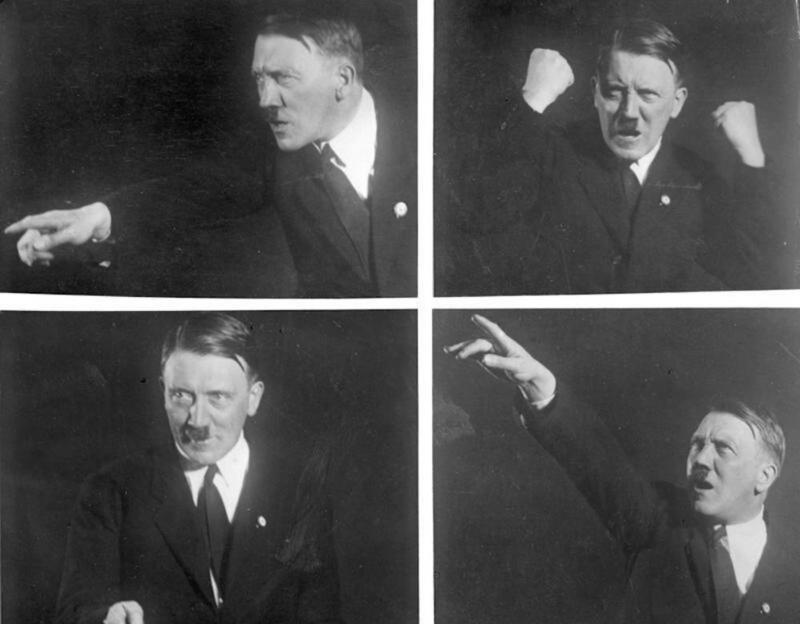 Hitler’s radical recasting of his public image in 1923 went further than that—and said a great deal about the kind of leader he was aspiring to become. A garden-variety demagogue might have simply created an outsized image for himself, an inadvertent sort of cartoon. Hitler did something more sophisticated. He made the case for a new kind of leader, and created a semi-fictional alternative version of himself that would fit his own job description. To sell the idea that he was Germany’s savior-in-waiting, and to boost his profile outside of Bavaria, he wrote a very short autobiography to be published together with a selection of his speeches. In the autobiography, he told the story of how his experiences as a young man provided him with revelations about the nature of politics that would allow him to save Germany from misery and make it safe for all times. But publishing such a self-aggrandizing portrait would have repelled Germany’s traditional conservatives, so Hitler searched for a writer with impeccable conservative credentials willing to pretend to have written the book. Doing so would come with a double payoff: Hitler’s shameless act of self-promotion would be concealed, while the impression would be created that he already was in receipt of widespread support among traditional conservatives. This led Hitler to Victor von Koerber, a blue-eyed and blond young military hero and writer. A North-German aristocrat, von Koerber was attracted by the promise of a new conservatism fused with the youthful idealism of National Socialism. The book—published under the title Adolf Hitler, sein Leben, seine Reden (Adolf Hitler: His Life and His Speeches)—was banned soon after publication, limiting its intended impact. Yet the book sheds light on how Hitler—in a moment rife for demagoguery—managed to rise to the top against all odds. When confronted with emerging demagogues, […] history thus cannot tell us until it is too late whether an individual is a Hitler, a Franco, a Lenin—or, for instance, a populist who, while flirting with authoritarianism, ultimately manages to withstand its seduction. Given that he wrote this stuff, Hitler’s need to pretend to be a mere “drummer” is simple: He had to square the circle. On the one hand, he desired to put himself in a position to head a national revolution. On the other hand, Germany’s conservatives had their own political ambitions. Hitler could only advance by pretending that he would be their tool, while attempting to create the impression that his support among them was already larger than it really was. The Hitler of this episode belies the common misconception that he was a primitive, raging, and nihilistic dark elemental force. Rather, he was a man with an emerging deep understanding of how political processes, systems, and the public sphere worked. His study of propaganda techniques while serving in World War I had provided him with an appreciation for political narratives that would help him plot his way to power. Getting Koerber to release his autobiography helped Hitler create a politically useful narrative. By making the case for a new kind of leader, without explicitly naming Hitler, it insidiously created the public perception of a gap that only he could fill: a man without a pedigree coming out of nowhere with an innate gift for seeing the hidden architecture of the world and hence to build a new Germany. In short, Hitler cleverly exploited the way the German political system and the public sphere worked, so as to build a place for himself. Demagogues come in several varieties, from populists with no genuine core beliefs to ideologues of various political convictions. They include rational as well as irrational actors. Some are figures who know when to retreat to moderation, and others never know where to stop, thus planting the seed of their regime’s self-destruction. The problem is that it is only in hindsight that we can tell how any specific demagogue will develop. Koerber and other conservatives thought that they simply could use Hitler. But they did not understand, at least in 1923, how the common language and style of demagogues-in-the-making looks very similar at the beginning, while their inner selves vary greatly. Unlike many others, Koerber of course knew how clever a political operative Hitler was, but the young aristocrat could not really see into Hitler and misjudged him. When confronted with emerging demagogues, in moments when people yearn for strongmen and novel kinds of leaders, history thus cannot tell us until it is too late whether an individual is a Hitler, a Franco, a Lenin—or, for instance, a populist who, while flirting with authoritarianism, ultimately manages to withstand its seduction. Victor von Koerber eventually learned the hard way that the person he had imagined Hitler to be when lending his name to him was a very different man from the one who would rule Germany. He grew disillusioned with Hitler in the mid-1920s after seeing how he presented himself once his trial (in the wake of his failed putsch) had finally transformed him into a public figure. In the late 1920s, Koerber began issuing warnings about the dangers Hitler posed to the world. But by then, it was already too late to stop him. Once the Nazi Party was in power, Koerber helped a prominent German Jew to get out of the country. And then Koerber began to feed the British military attaché in Berlin with intelligence. Koerber ultimately landed in one of Hitler’s concentration camps, which he barely survived. Thomas Weber, the author of Becoming Hitler: The Making of a Nazi (Basic Books), is Professor of History and International Affairs at the University of Aberdeen in Scotland.